BobbyDarin.net/BobbyDarin.com - "Bobby Darin Sings Ray Charles"
Billboard's LP chart for 11 weeks. 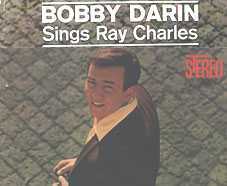 Bobby Darin Sings Ray Charles was Bobby's tribute to one of his idols. With Nino Tempo on Saxophone, the LP contained the single, "What'd I Say," which earned Darin a GRAMMY nomination for Best Rhythm and Blues recording.